Technical Skills development is the key to any top level soccer player. 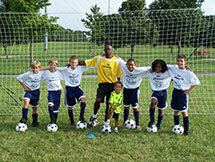 Soccer KEMistry is a year round skills program founded in 2006 which focuses on technical skills development. The program includes weekly Skills Sessions along with various Skills Leagues, Skills Camps, and Skills Tournaments designed specifically to reward the best technical skills. Each KEMist is initially evaluated and certified at a level. Coach then creates a friendly but competitive environment to guide and inspire the KEMists to reach their highest level. If you know someone who could benefit from some skills training, give them the gift of training with some of the best skills coaches.